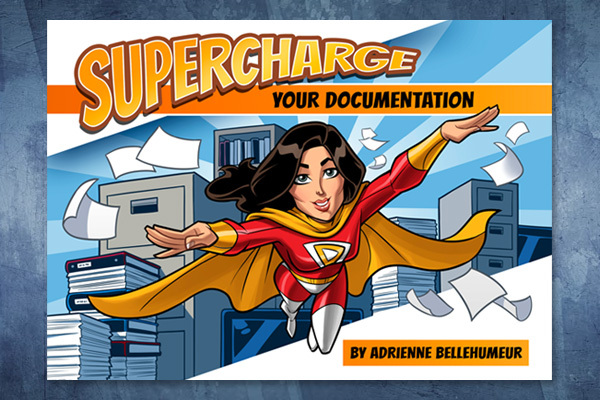 Supercharge Your Documentation is a project collaborated on by Adrienne Bellehumeur, Jan Eden, and NDDesign. The brilliant illustrations are by George Sellas. It is one of the most fun projects I (Heather) can remember working on. NDDesign’s role was the graphic design and layout of the book, and the design of the corporate website www.leadersinbusinessanalysis.com. Whenever the term “Documentation” is mentioned, most people’s eyes glaze over. What is Documentation? What is so great about it? Why is it necessary for small to large corporations to use it? Adrienne created this book to put Documentation into laymen’s terms and to remove the assumption that Documentation is an administrative or “low-level” task for a business. Adrienne herself is the super-hero on the front cover and throughout the book, rescuing companies and people from mountains of paperwork and creating processes and strategies to increase the companies’ value and run more smoothly. The book is an easy read, with small chunks of information, an attractive layout, and delightful illustrations. NDDesign worked with the client from beginning to end of the project, from handling the design, illustration and layout of the book – to the publishing and distributing of the book on Amazon.